Is FP MARKETS one of the best Australian Forex Brokers? We conducted an in-depth review in April 2019 to find out the answer and bring it to you! Established in 2005 FP Markets (First Prudential Markets Pty Ltd) is an Australia-based Forex and CFD broker that is headquartered in Sydney. FP Markets is one of the most recognised brands on the Australian Forex and CFDs market with an outstanding reputation and large client base. Holding an Australian Financial Services Licence (AFSL) and being authorised and regulated by the Australian Securities and Investment Commission (ASIC), FP Markets ensures that all client money is held safely in a segregated bank account and is never used for hedging or other operational purposes. FP Markets does not accept applications from U.S, Japan or New Zealand residents or residents from any other country or jurisdiction where the use of their services would be contrary to the local laws or regulations. FP Markets doesn’t take its clients’ safety and security lightly and ensures that all user data is stored on secure servers. Clients have access to a wealth of over 10,000 trading instruments including currency pairs, indices, metals and commodities, equities, shares and one digital asset (Bitcoin). The trading account type is tied to the asset being traded and the platform used for trading. There are various Forex, share trading and CFD account types available at FP Markets, as well as an Islamic (Shariah compliant) and demo account to test the trading environment. Charges, fees and margins depend on the account type used and are at a highly competitive level. For example, there are two different Forex trading account types available. 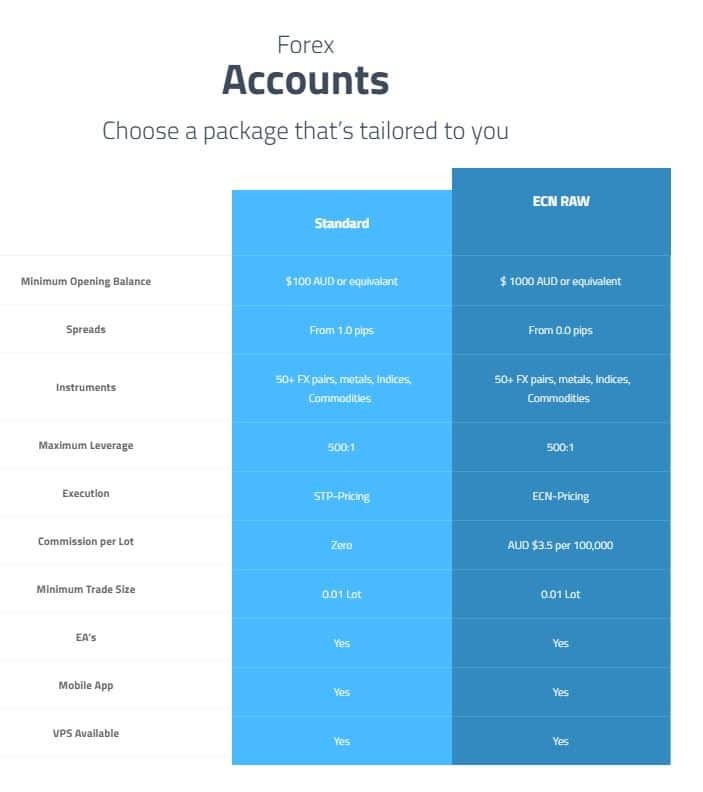 The Standard account, a STP account type, runs commission-free. Instead, spread-markups from 1.0 Pips apply. FP Markets' ECN Raw account option uses ECN execution and commissions of $3.50 are applied for every lot traded. Both account types offer trading of 50+ Forex pairs, as well as indices, commodities and metals. Leverage can be set as high as 500:1. There are three different CFD trading account variations available, all providing access to direct market access (DMA) commission and margin rates. 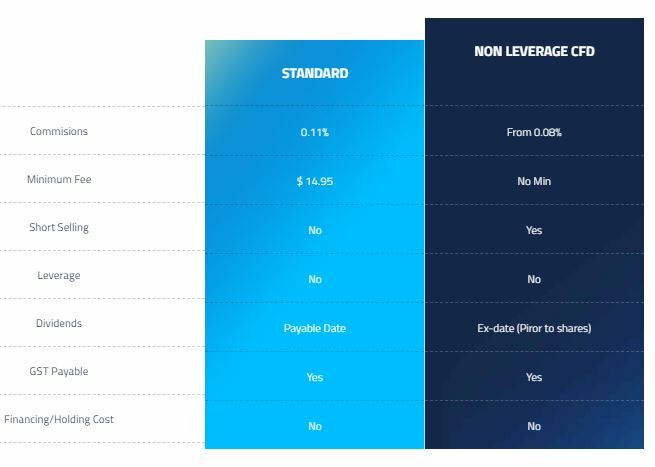 The two different share trading accounts available are FP Markets' Standard account that requires a minimum fee of $14.95 and where commission of 0.11% are charged, and the Non Leverage CFD account that asks for no minimum fee and runs with commissions of only 0.08%. First, there is the popular Metatrader 4 (MT4) and its younger brother Metatrader 5 (MT5), which are both well known in the Forex and CFD trading scene. On top, FP Markets offers the IRESS Trader trading platform which allows access to all 10,000+ markets. IRESS Trader is the industry leader in direct market access (DMA) execution systems. It is a web based platform that dynamically streams data across multiple product types and exchanges. By combining access to full market depth, an enhanced in-house charting system for advanced technical analysis with live news flows, IressTrader provides everything the modern trader needs to maintain their edge in the market. All three trading platforms are built on HTML 5 technology which is supported on all major web browsers for both Windows and MAC (OSX). All platforms are also available on mobile for both Android and iPhone/iPad devices. Money managers have further access to Multi Account Manager (MAM) and Percent Allocation Management Model (PAMM) allocations that offer numerous trade allocation methods including, Equity, Lot and Percentage. The Head Office of FP Markets is located in Sydney, Australia. Two additional branch offices are located in Beijing and Shanghai. Over the years, the brand has won multiple industry awards in areas such as customer satisfaction, best education material and trade execution. Award winning 24/7 customer support is available through fpmarkets.com via their live chat facilities, as well as email and telephone. Dedicated, individual account managers are assigned to all serious traders, that can help to further improve the overall trading experience. A small FAQ section helps answering the most common queries about account opening, funding, security or general trading account questions. Funding options include credit cards (VISA and Mastercard), Neteller, Skrill, POLI, BPay, Bank Transfers, FasaPay and Broker to Broker transfers. Forex traders have the choice of two Forex trading account types that offer access to 50+ Forex pairs, as well as indices, commodities and metals with a maximum leverage of 500:1. 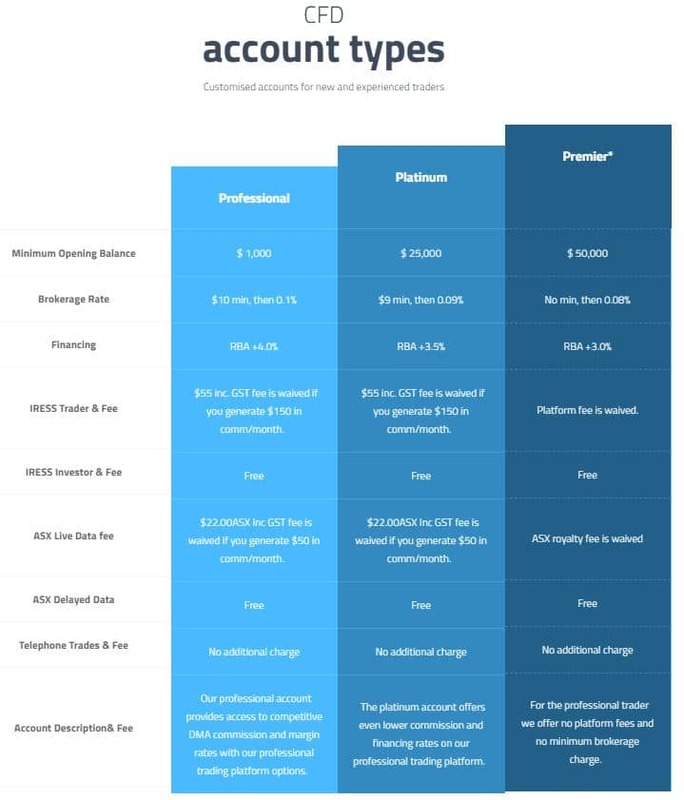 The Standard account option requires a minimum deposit of only $100 and no commissions are charged. Instead, spread mark-ups of minimum 1.0 Pips are applied. The minimum deposit requirement for the ECN Raw account type is $1,000 and commission of $3.50 per lot and side are charged but no further spread mark-ups are applied. The minimum opening balance is $1,000 and the minimum brokerage fee is $10. IRESS trading platform fee of $55 is charged monthly. The fee is waived if the trader generates up to $150 in commission per month. The minimum opening balance is $25,000. The platform fee charges ($55 per month) apply but waived just like on the Professional Account. The minimum brokerage fee is $9. The minimum opening balance is $50,000. For this account type, there are no platform fees and no minimum broker charges. Commissions start from 0.11% and a minimum fee of $14.95 is required. No minimum fee is required and commission starts from 0.08%. With the IRESS trading platform clients have access to all available financial instruments. From currency pairs, CFDs as well as shares, all 10,000+ assets and markets can be traded with the powerful IressTrader. Excellent trade execution with STP and ECN pricing. Three powerful trading platforms available: IressTrader, MT4 and MT5. 10,000+ markets to trade in. Tight spreads starting from 0.0 Pips. Low minimum deposit requirement of only $100 for Forex trading accounts. FP Markets offers three powerful trading platforms and allows access to 10,000+ markets to trade in! FP Markets is one of Australia's top online Forex, CFDs and share trading brokers providing award-winning service to its large client base. A wide range of over 10,000 markets can be accessed with this Sydney, Australia, based brokerage firm. Highly recommendable!